It seems like forever ago now that our youngest daughter graduated from college and we helped her move to Chicago. That was certainly a memorable trip, not just because our daughter was moving to a big city, but because it was our first trip to Chicago. 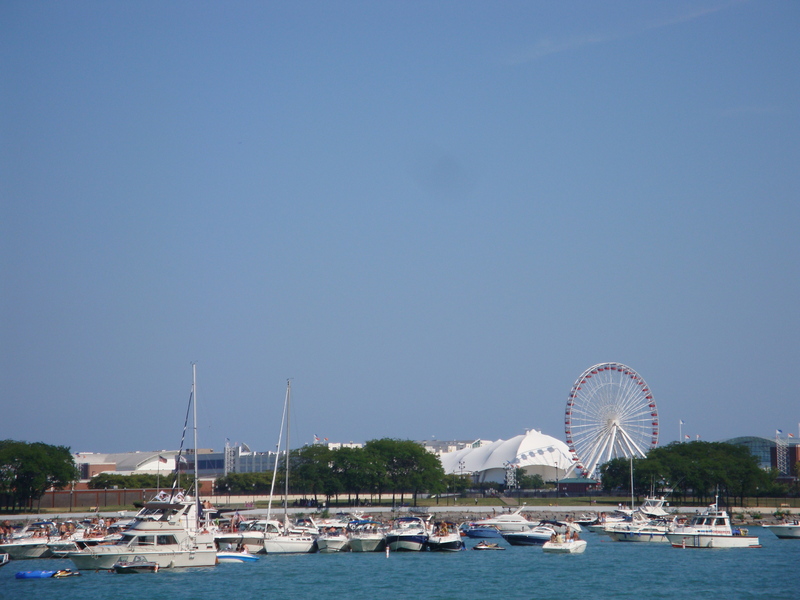 Amazingly enough, we’d probably flown through Chicago a hundred times, but never actual spent any time in Chicago. We have been back several times since and every visit, regardless of the time of year, has been wonderful. 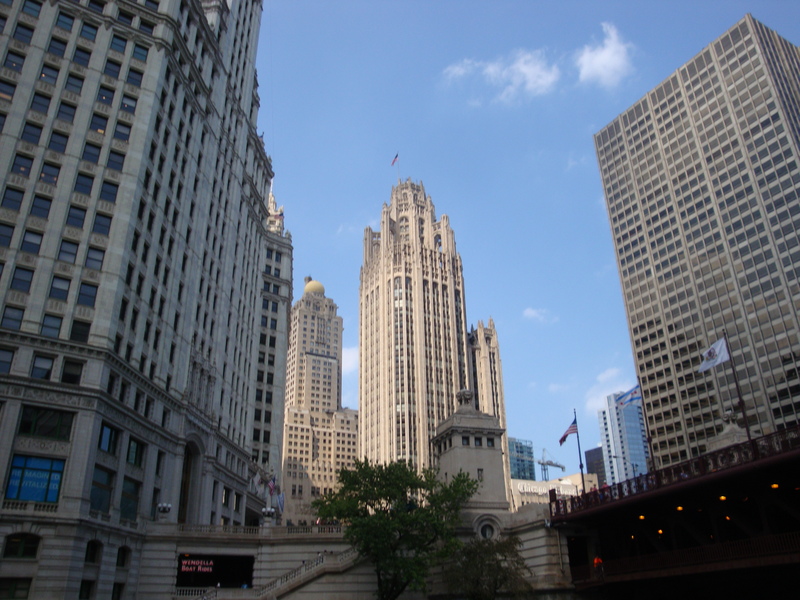 Obviously, seeing our daughter is always the highlight of the trip, but there is so much to see and do in Chicago that it makes for a wonderful getaway. We’ve even been there during winter, which can be pretty cold, but we still had a wonderful time. Our first trip, however, was quite the experience. We decided to make the sixteen hour drive in a single trip, driving our daughter’s SUV with a trailer in tow. We spent the night before the drive in Boulder so that we could make as early of a start as possible. We arrived at her apartment at 6:00 a.m. where the expectation was that the trailer would be packed and her and her new roommates would be ready to go. Needless to say, they weren’t ready when we arrived, so our morning started with scrambling to finish packing and making sure that the apartment was cleaned up. An hour later than we had hoped, we were on the road. The drive started out fine as we made our way across Colorado, through Nebraska, and into Iowa. After driving for about thirteen hours, the highway suddenly came to a crawl. After checking the road information, we found that there was a bad accident several miles ahead and the highway was shutdown. Traffic was being rerouted to a rural single lane road in order to get around the accident. After two hours crawling along at an excruciating slow pace, we were finally passed the accident and on our way again. The rest of the drive was fine, but after the late start and delay, it was now nineteen hours later and 2:30 in the morning. 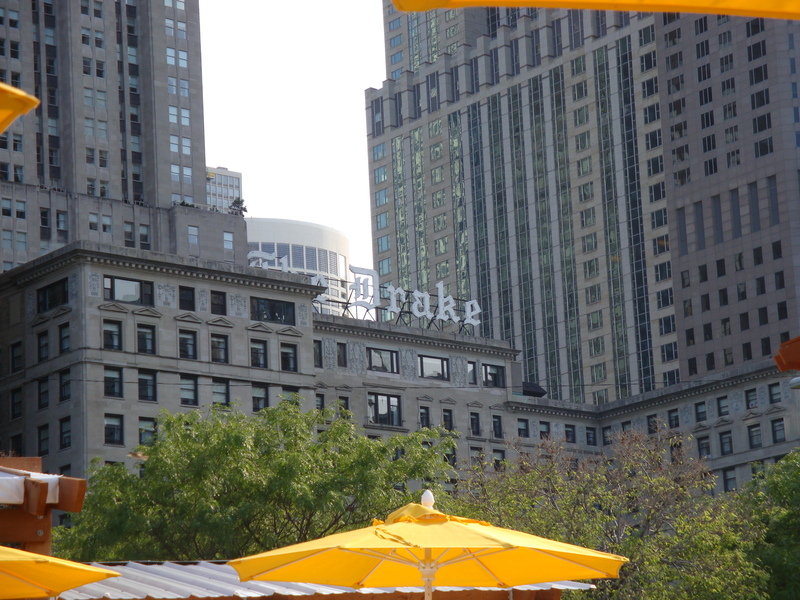 We drove to the Drake Hotel, where we were staying, and let the kids take the car and trailer to their new apartment. Exhausted from the time on the road, we went to the front desk to check in. We were told that the room we had reserved was flooded and they needed to move us to a different style of room that was smaller than the one we requested. Our response, “does it have a bed?”, that was all we cared about at this point. The receptionist told us to leave our bags in the room in the morning when we left to unpack the trailer and help our daughter move into her new apartment and the hotel staff would move us to our room, once it was dried out. So, the following morning, we helped our daughter move in and headed back to the hotel in the afternoon to take a nap since we’d only had about five hours of sleep at this point. We went back to the front desk to get our new keys and were told that the room still wasn’t dry, so they had put us in a different room. We took our keys and headed to the elevator to go to the room. 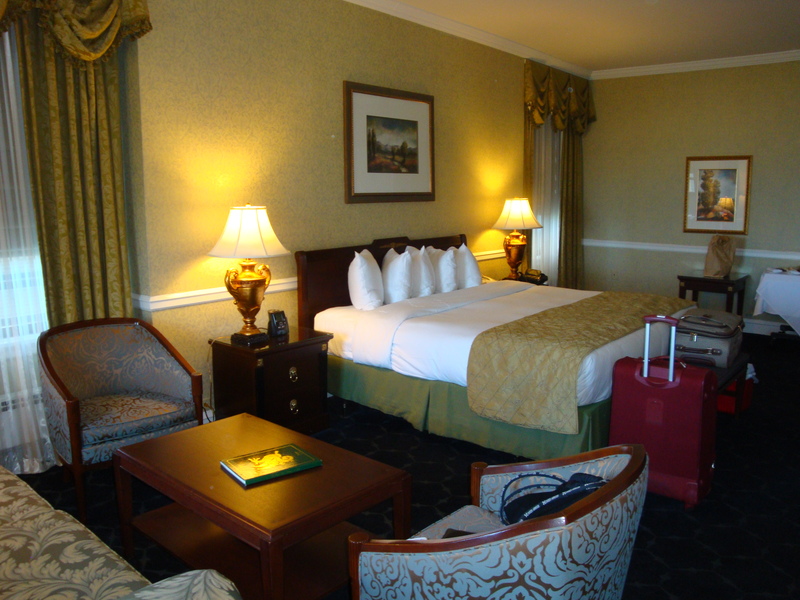 As we walked down the hallway, we realized that they had put us into a junior suite. The room was massive, with a living room area as well as a small dining area. 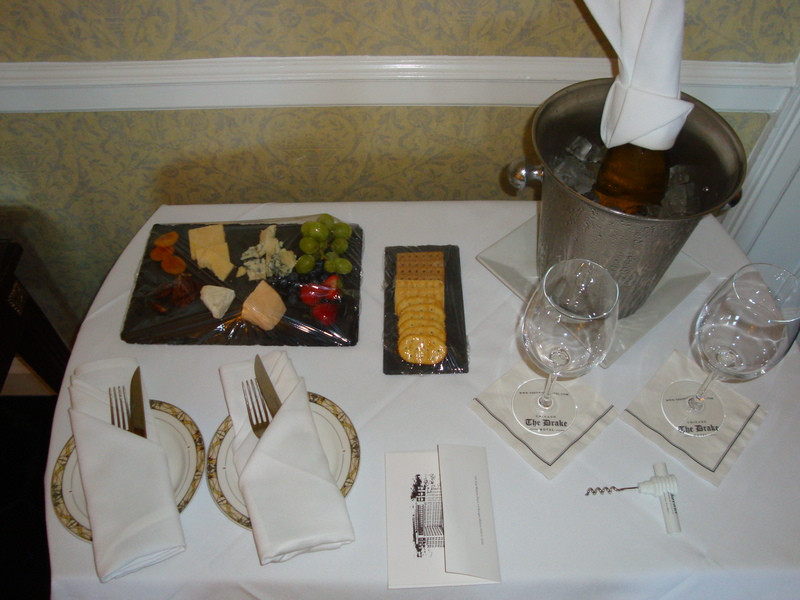 It was a corner room, with views of Lake Michigan from the large windows, and the staff had left a bottle of champagne with some fruit, cheese, and crackers for our inconvenience. The rest of our trip was looking up. The next day we were off to do normal tourist stuff. 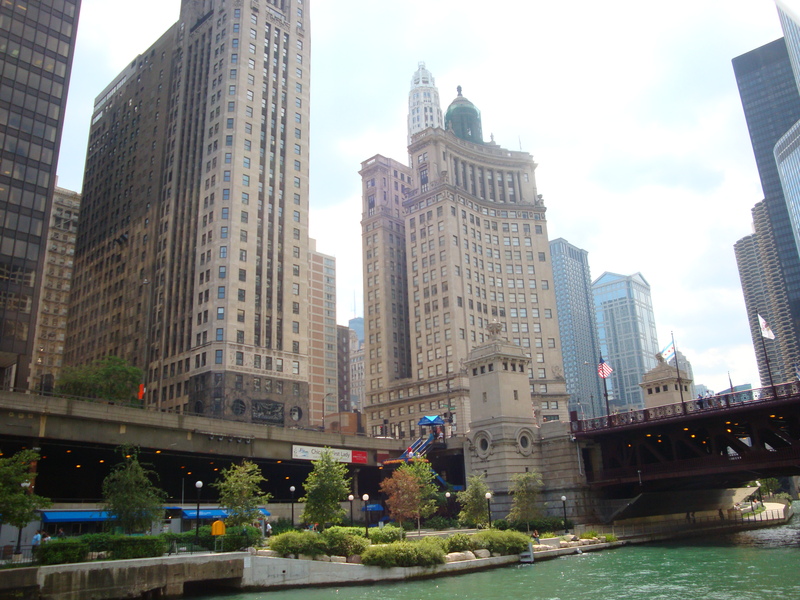 We took an architectural river tour where we learned that Chicago is quite proud of being the home of the first skyscrapers as well as the varying styles of skyscrapers throughout the city. 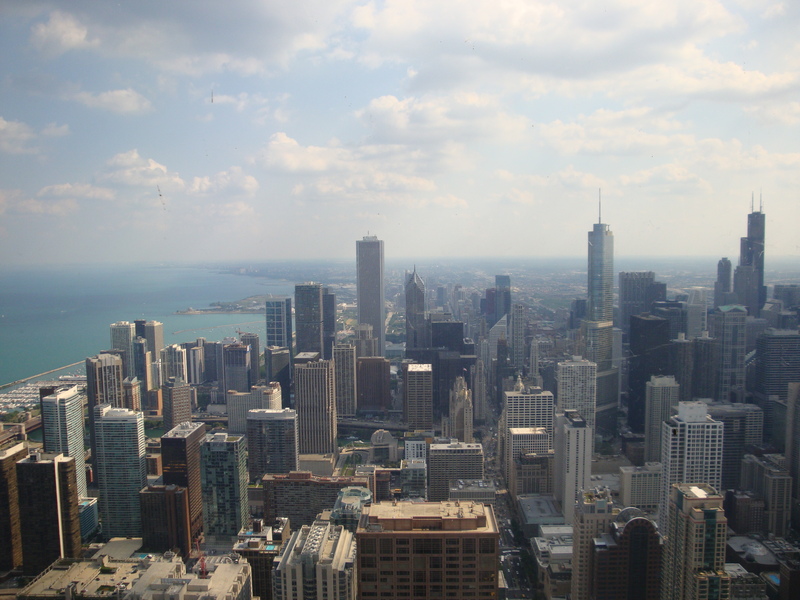 We went to the top of the Willis Tower (it is still the Sears Tower to us) and went to several restaurants, including Ditka’s, which we have returned to many times. 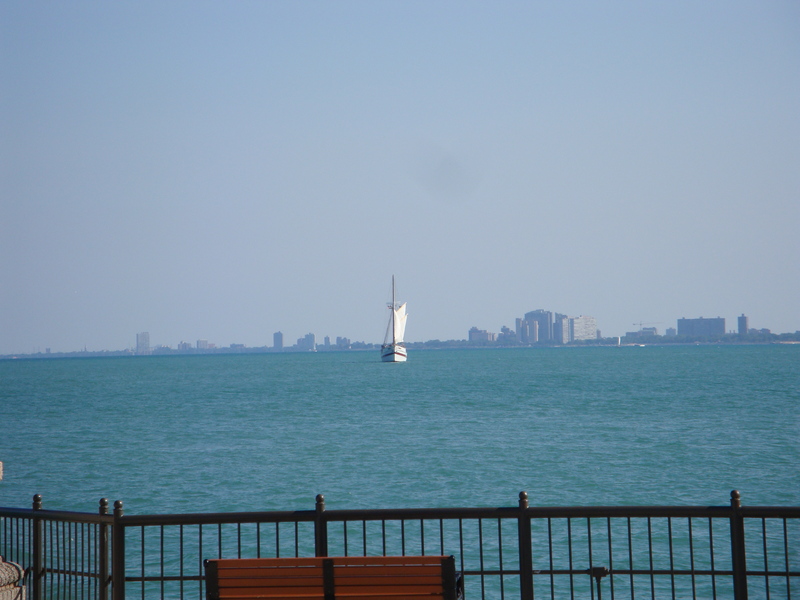 The next day we went to the Navy Pier and walked the beach as well as visited the Field Museum of Natural History. 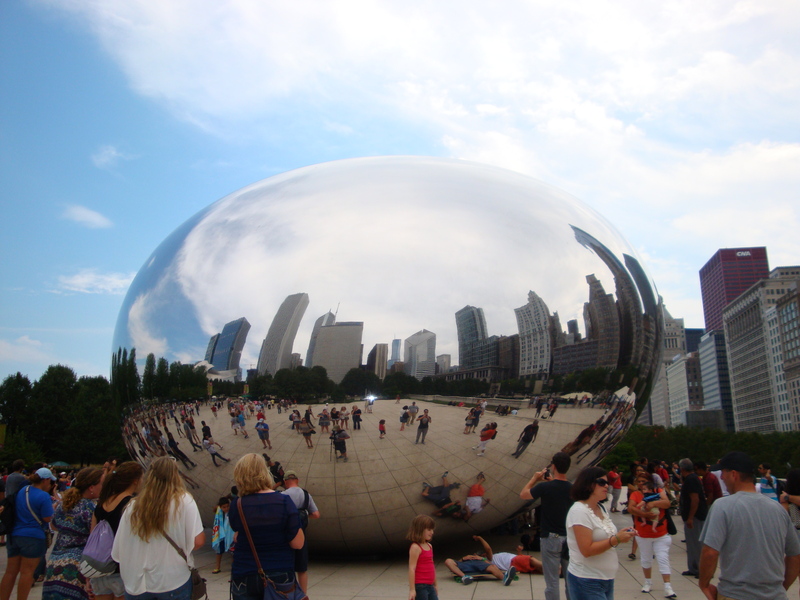 We went to Millennium Park and saw the “Bean”, which is really called the Cloud Gate. We even walked the Miracle Mile and wondered in and out of shops, even the designer stores with prices so astronomical that no normal person could possibly afford them. In the end, after a stressful start, our first trip to Chicago helped us fall in love with the city. We have been back several times, usually flying, but we did drive one other time, however we spread the trip over two days. 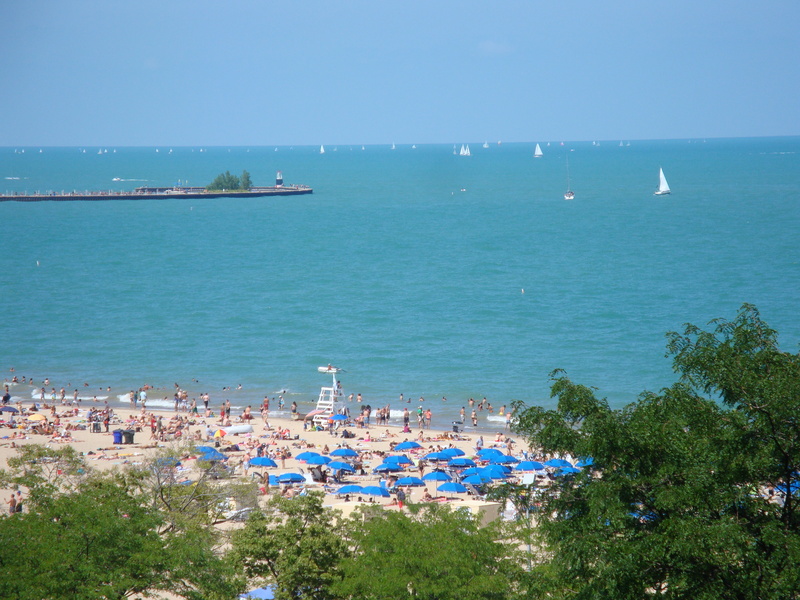 We tell everyone that Chicago is a “small big city”, meaning that the people are friendlier than cities on the east coast, but there is as much to do, see, and attend as any other city that we’ve lived in or visited. Even if our daughter moved away from Chicago, we’d still make a point of travelling there every now and then and take advantage of everything the city has to offer. 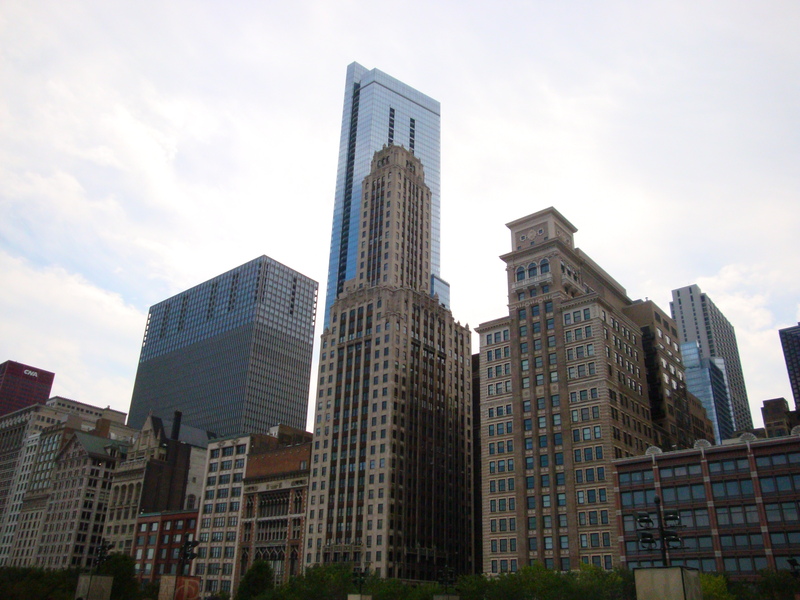 This entry was posted in Chicago and tagged architecture, chicago, chicago bean, cloud gate, drake hotel, field museum, millennium park, miracle mile, skyscraper, travel, willis tower. Bookmark the permalink.